The gilding of exterior architectural ornament goes back hundreds of years: Gilded domes, spires, steeples and other ornament abound throughout France, Belgium and other Western European countries, as well as the US. Well-known examples occur across Russia in the gilded minarets and onion domes associ­ated with the orthodox churches and government building, such as those in Moscow and St. Peters. In the United States, one of the oldest gilded exterior structures is the Bullfinch dome and lantern atop the Massachusetts State House. Dating from the late 18th century, this copper dome is due to be re-gilded as part of the general restoration of the State House Complex. Gilded domes and statuary are associated with many state capitol buildings in th1s country. The Colorado State Capitol in Denver and the Iowa State Capitol in Des Moines are two of the oldest gilded domes west of the Mississippi. The Quadriga statue on the state capitol in St. Paul, Minn., has recently undergone restoration and re-gilding. In all, 13 state capitol buildings have gilded domes and others have gilded statuary associated with the capitol buildings. Some of these domes are made of copper, others are lead-coated copper, and still others are cast iron, lead-coated copper, or combinations of metals. In addition to government buildings, there are many religious and com­mercial buildings in this country with gilded metal ornamentation that dates from the 18th, 19th and early 20th centuries. While the gold leaf used to gild these structures is the same as it has been for thousands of years, the underlying primers and methods have changed dramatically. They are still changing today. The historical literature on exterior gilding of metal is sparse to nonexistent. This 1s mainly due to the formation of guilds in the Middle Ages. The members jealously guarded their methods and secret formulas, only passing them down orally from fo1her to son after a long apprenticeship. Nothing was written down because it could fall into the wrong hands. This attitude towards “trade secrets” has persisted well into this ce1tury, and exists even today among stodgier members of the gilding trade. Some of the earliest printed matter alluding to gilding on metal shows up In the “Painter’s and Varnisher’s Pocket Manual” published in London in 1826. While mostly concerned with the carriage trade and varnishing. it does make reference to gilding steel by dipping the object in a solution of ether into which the gold has been dissolved. This is not suitable for any large pieces in exterior environments, of course, but it is one of the earliest mentions of gilded metal. This little manual does provide a good recipe for oil size: ‘To prepare gold size, grind some red lead with the thickest drying oil you can get, the older the better; before using it, it must be brought to a proper consistence with a little oil of turpentine. If the size is good, it will dry sufficiently in about twelve hours, to allow of the gold being applied to it. Though almost 200 years old, the basic concept of slow oil size hasn’t changed all that much. Beyond the cursory mention of gilding with ether, there is no other mention in regard to metal in this early volume. ln the 1894 edition of the same manual, published by Baird and Co. in Philadelphia, there is a little more information regarding gilding on metals. While the method of dipping steel into ether is again explained (practically “verbatim from the 1826 text), there is also mention of the gilding of “inferior metals” such as copper, brass, etc. This is described as using an amalgam of gold and mercury applied with heat to the metal. then burnished. Whether this method would l-e appropriate for exterior use is never discussed. Originally published in 1876, ‘The Gilder’s Manual” has a section on (Gilding on Metals that is over 24 pages long. There is only one paragraph devoted to actually applying gold leaf to metals. n,e metl1od outlined has the metal, whether copper, brass, iron or steel, heated to a blue shade, then having the leaf applied to it while hot. This may be possible for large exterior objects, but not very practical. The rest of the section is devoted to using amalgams and to electroplating. An English text published in 1915 delves a little deeper into the gilding of metals. This is the first example encountered by the author of methods that could be practical for exterior use. The techniques include coating new iron­work with hot boiled linseed oil or two coats of varnish. It also stresses applying two coats of varnish over copper or bronze before gilding with imitation gold leaf. Copper leaf. or copper leaf to prevent tarnishing. It seems the two layers of sealer are enough to forestall any galvanic reaction between the dissimilar metals. Old painted ironwork is discussed at length with removal of the paint recommended. This is followed by application of two coats of sealer. Oddly enough, there is no recommended preparation of copper for genuine gold. The practitioner is urged to gild directly on the copper with a slow size. This would not last under exterior conditions. Generally, it seems by 1915, the written texts are disseminating more reliable techniques in regards to metal. But even so, there is no specific mention of exterior gilding. An early reference to gilding on exterior metal is found in a manual on oil gilding originally published around 1930. lt has since been distributed by some of the gold leaf suppliers in the United States. Specific procedures for chemical neutralization of zinc and galvanized iron are explained. Aluminum is mentioned, but not copper and bronze. The use of several coats of red lead and white lead primers is universally promoted for almost all types of exterior metal. Red lead and white lead are mentioned as primers for almost any material, including wood, plaster, stone, etc. For several hundred years, lead primers and paints were used universally on exterior and interior surfaces. Perusal of old photographs of town populations will show the painters looking very sickly, perhaps suffering from the “painter’s colic” or more likely lead poisoning. a not uncommon ailment for painters at that time. As early as 1826, the ‘”Painter’s and Varnisher’s Pocket Companion” has a large section devoted to common ailments and “vapors” suffered by members of the trade. In later editions, there is more space devoted to the health hazards of the trade, with particular emphasis on exposure to lead. ln spite of the increasingly apparent risks associated with lead compounds, they were still in common use in the painting and gilding industry until the mid-20th century. Examination of the Bullfinch Dome on the Massachusetts State House shows evidence of white lead and red lead under the latest layer of primer, which is zinc chromate. It is reasonable to assume that these traces of . lead paint represent a continuation of the tradition of using lead-based primers over copper surfaces. Coupled with lead primers was the use of lead compounds in the size and driers associated with the varnishes frequently used on exterior gilding. By the 1950s the use of lead was proscribed in paints for the housing industry, and by the end ol the 1960s was strictly regulated for most other uses. However, for practitioners of exterior gilding. this presents a whole new set of problems. While lead hazards are not encountered daily during the application of primers and size, lead ts frequently found in the primers on old surfaces needing to be stripped and re-gilded. Strict regulations apply to the handling of lead and other compounds removed during the stripping and preparation of the surface; lead abatement has now become a part of the gilder’s work. In the specifications for the restoration of tl,e gilding on the Bullfinch Dome on the Massachusetts State Capitol, the state requires that lead abatement of the surface of the dome be included under the gilder’s scope of work. This presents the gilder with complex licensing. insurance, and training requirements not normally associated with the trade. While the regulation of lead compounds safeguards the health of painters. gilders, and the public, there are new problems presented with the outlawing of these primers. What is to be used in their stead? Although lead primers presented health risks, they worked very well on most metal surfaces to be gilded. When it became apparent lead would be banned, the painting industry started exploring alternatives to lead primers for metals. One primer that came into widespread use is zinc chromate. Developed specifically for rust inhibition, it has been widely used as a primer under gilding on a variety of surfaces, including lead-coated copper, copper, cast iron, terne-coated copper and others. However, the days of using zinc chromate are numbered. Already, regional environmental commissions are regulating the distribution of zinc-rich and chromium-containing products. In many areas of the country, including the tri-state area around New York City and in California, the sale of zinc-chromate is prohibited. Federal regulations require that removal of zinc chromate is to follow the same procedures as lead abatement. Many paint manufacturers have stopped making zinc-rich primers altogether and are developing replacement products. 1nese same governmental bodies are also applying VOC (Volatile Organic Compound) requirements to paint and primer composition. The amount of free thinners must be drastically reduced to meet these standards. This has led paint manufacturers to (1) In­troduce voc-compliant products into the affected regions only and (2) Continue distribution of non-compli­ant items in regions of the country not yet covered by the regulations. Un­fortunately, manufacturers package the voc-compliant products and non-compliant products with the same names and essentially the same labels. This leads to quite a bit of con­fusion when working in several different regions of the country, not to mention the problems it can cause when trying to use a voc-compliant primer under slow oil size. Of course, the problem doesn’t manifest itself usually actually trying to apply the size over the already prepared and primed surface and discovering the two materials are not compatible. The gilder then has to decide whether to: (1) Strip the surface and start over again; or (2) Apply a barrier coat that will be compatible with both materials. Another reaction of paint manu­facturers has been to introduce a completely new genre of paints and primers known as water-borne al­kyds. Unfortunately, many of these new products also contain silicone products and are not designed for use on metals, Furthermore, with the presence of silicone, these products arc generally not compatible with slow oil sizes. However, there are other products designed for use on metals which can be useful to the trade. These are not zinc rich, do not contain chro­mium, a.nd are voe compliant. Some of these are catalyzed or moisture­ cured urethane primers that are pri­marily aimed at the roof coatings industry. Others are water-borne bonding primers for use on a wide variety of materials. There are also butyl-based primers available that may be satisfactory under certain cir­cumstances. Clearly, there are not primers available now that will act as a “silverbullet”in the same manner as the lead and zinc chromate primers of the past. Lacking access to “one stop shopping” the gilder needs to be very careful and constantly research the usefulness and compatibility of the various primers available, especially when working in different regions of the country. There is no substitute for testing and experimentation. In conjunction with the development of new primers and paints# there are also new adhesives being developed specifically for exterior use. These are acrylic based and have undergone several transmutations since they were introduced 5 years ago. The 1nanufacturers feel these are the wave of the future and will be acceptable substitutes for traditional oil size. This may well be the case, but many gilders are hesitant to try new technologies on large structures, es­pecially when the materials have not stood the lest of time. Frequently, adherence to conservation standards will preclude experimenting with new materials on a historic piece. From an economic point of view, it would be very difficult to justify ap­plying an adhesive that has only been in production for 5 years ru1d supply a 10 year warranty (which is fre­quently demanded by the customer) on the finished product. St. John’s Church in Washington D.C., was built in 1816 and originally had a gilded copper dome atop the cupola over the center of the building. In 1822, a front portico and bell tower with a second gilded copper dome was added. Located across Lafayette Park from the White House, the church and its two gilded domes are a reminder of a city with small neigh­borhoods and churches lovingly pre­served by loyal congregations. This church has never been restored, yet has been well maintained over the years with constant care and attention. The original cupola was recently repaired and re-gilded by The Gilders’ Studio. 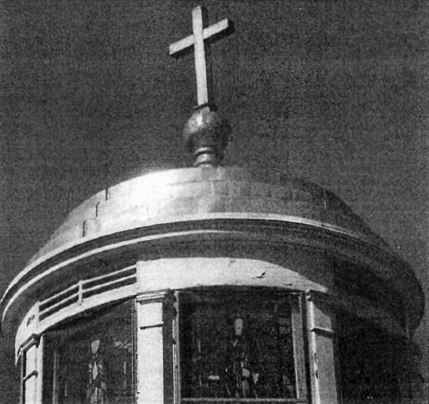 Church records show the cupola had quite a bit of work done to it in 1912 and 1957, which is when the dome and cross were last gilded. While the original dome was copper (and the second dome on the bell tower is thought to have its origi­nal copper) the central dome had de­teriorated to the point where it was replaced with lead-coated copper in 1912. Lead-coated copper came into use at the end of the 19th century as a roofing material. While frequently left uncoated to weather naturally, it was also gilded on occasion -with mixed results. There have been some spectacular failures associated with gilding on lead-coated copper. These include the original gilding on St. Vartan’s Cathedral in New York City, completed in 1967 ru,d which failed by 1970. The West Virgi1tia State Capitol Dome, originally gilded in the 1930s, also failed within 10 years. However, other lead-coated copper surfaces have been successfully gilded, including 10 Light St. in Baltimore in 1929 and others. As with most projects, proper preparation most likely made the difference be­tween premature failure and a long­ lasting job. While the dome and cross on St. John’s Church had originally been primed with white and red lead, these products were no longer available. Lacking a “silver bullet,” different approaches had to be researched to de­termine the best course of action for preparing and priming 5 different metal surfaces. After consultation with paint manufacturers, chemists, and the Copper Development Assn., it was determined that several differ­ent treatments and primers would be required (see adjacent photos). All materials had to be researched and tested to determine compatibility between the various components. After extensive preparation, the dome was gilded using 23.5-K gold leaf with excellent results and confi­dence it will stand the test of time. Fifty years earlier, the job would have been much simpler -albeit more toxic. On many projects today, the gilder must adopt a new role -that of a hazardous abatement contractor. Sizes are also undergoing changes, with the development of new acrylic sizes that may one day become the standard. At the same time, other regulations cause some materials to be available in some regions, but not in others. Until environmental and voc-requirements become uniform, the po­tential for confusion and problems on installations will continue. The only safeguard is to continually test and experiment with the actual products available in the particular region one is working in. Careful planning, testing, and research with manufacturers and other experts will ensure that projects in any region will maintain the beauty and longevity tradition-ally associated with exterior gilding.